Abstract: This paper focuses on manuscripts with Latin copies of Aristotle’s works produced for educational purposes between c. 1100 and c. 1300. During these two centuries a shift is observed in how Aristotle was used in the classroom: from a teaching instrument in monastic education in the twelfth century, to a means for training students in the university classroom during the thirteenth century. This paper draws attention to a parallel shift in the material format of Aristotle manuscripts produced in these centuries. 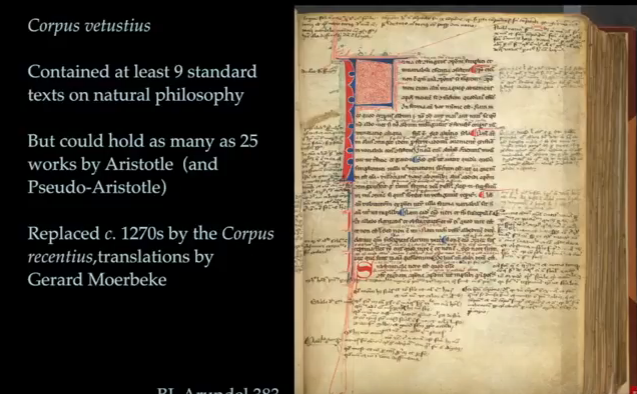 With the rise of the university, c. 1200, arts faculties across Europe began to adopt the so-called Corpus vetustius as their standard textbook, a volume that encompassed a substantial number of texts by Aristotle. Focusing on the codicological and paleographical traits of the ninety-odd surviving copies, the aim of this paper is threefold: to identify the shared codicological and paleographical features of Corpus manuscripts; to highlight how these features may be understood as a new book format, distinctly different from twelfth-century copies of Aristotle; and to show how this new book format was adopted throughout Europe. The observations presented relate to several threads running through the “Cultural and Textual Exchanges” seminars: the appearance of a new book format within a specific cultural context; the diffusion of new bookish features across geographical space; and the strong ties that exist between the physical features of the Latin manuscript and the manner in which the object was used.